Amy´s Soap Challenge Club Part 3 - the theme for this month is Holly Swirl. A technique that looks beautiful and that I have never tried, so I am in. It took me a while to get inspiration for this soap. I had several ideas but none of them felt to be just the right one for this particular design. I went through my fragrances and nothing really caught my attention apart from Seaweed and Juniper FO. I haven´t used it so far, it has this kind of air-freshner like scent and I think it would be challenging to create a nice blend with it. So again no idea. Walking, looking, feeling....finally an idea came to my mind. I mixed the shades using oxides and micas, used my standard colouring-and-swirling recipe. And used the Seaweed and Juniper FO, a blend with Yellow Mandarin EO, Lavender, Cucumber FO and Cedarwood EO. I am really pleased with the result, the soap looks almost the same like in my mind and I like the scent as well, it´s very nice on skin after washing. Fresh marine scent with a soft touch of Mandarin and Lavender, and an anchor of earthy Cedarwood. Creamy soap with buttermilk and pink clay. Looking forward to seeing all the other soaps, I have already seen some of them...beauty. Thanks Amy! Wow, I wish I could smell your soap, what a lovely scents combination!love your add of pink clay! Oh thank you, I think the scent develops nicely with time, I like it more and more. Thank you, I think the same about the ash, I get ash a lot as I like butters, esp. 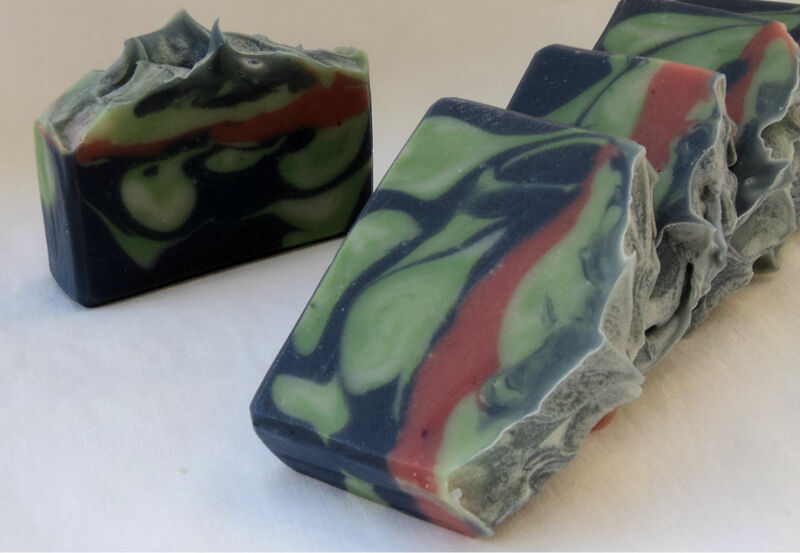 with shea butter - but in this soap I think it really adds to the look. Thank you, I aimed for a little more distinct swirls but did not want to use TiO2 this time (I don´t like its feel and prefer to go without it when possible) + my soap moved quite fast but anyway I like the decent swirl as well. Beautiful! The colors and look match your fragrance blend! Oh, I would love to smell your soap! Very nice color choices for the swirls. Thank you, I am also pleased with the colours - they came out exactly as I intended. Very striking soap! The scent combo sounds very pleasant and intriguing. Love the end result. Beautiful soap! I love the color combination. Lovely! I like the colour combination - very striking!